of Natasja Vos. See more photos on page 11. 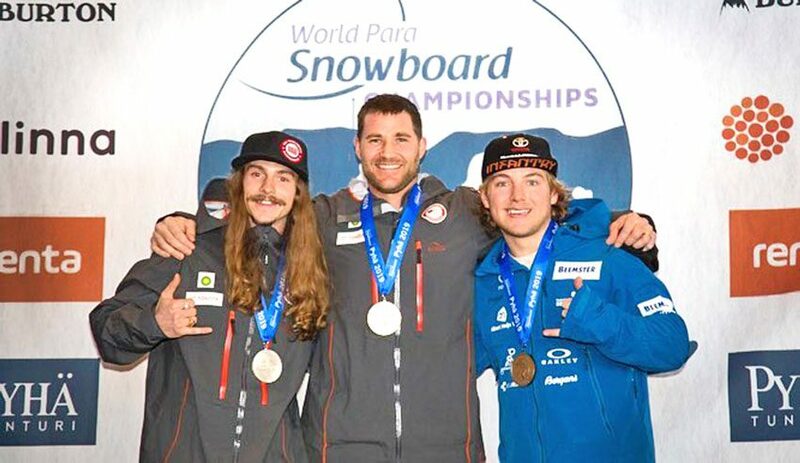 The winners’ stand for banked slalom at the 2019 Para Snowboard World Championship in Pyhä, Finland, with World Champion Mike Schultz (center), Team USA teammate Noah Elliott in second, and Netherlander Chris Vos. It was thrilling news a year ago when Kimball native “Monster” Mike Schultz earned a gold and a bronze in the 2018 Paralympics in Korea. It could have been the end of a fulfilling career for 36-year-old Schultz, retiring from competitive sports with a “bang” after such an achievement. But not Schultz. Instead of retiring from competition and focusing on developing and building prosthetics with his company BioDapt, Schultz set another goal: World Champion in 2019. And it is no surprise to anyone that he achieved that. second behind Schultz. Chris Vos of the Netherlands was third. Schultz’s competition included 47 other male world-class athletes with lower-limb impairments. “I still had one more goal after winning Paralympic gold and silver last year, and that was to win at world championships,” Schultz told Brianna Tammaro for Team USA. “I came up a little short a few years ago and, this year, my focus was on world championships here in Pyhä, Finland. It’s been an amazing day of competition, and I’m so pumped to bring home gold for Team USA once again. It feels so good to be world champion. Two days later, he was back on the slopes in boardercross where he earned a bronze medal behind Elliott and Vos.